This wrist gave me the most trouble of the whole project. 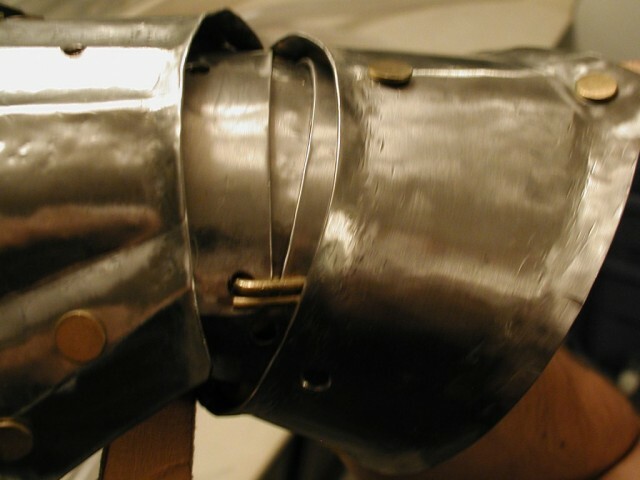 In the original design there was only one wrist plate (bah!). Added to the thick leather strips and rivets, plus an under-estimation in the size of the bell (the part at the arm end), the extra plates made the wrist section un-navigable by my hand. Expanding the bell, re-working the wrist plates, and some improvised brass staples seem to have solved the problem.